Upper Severn Overbank Flow shows promise. 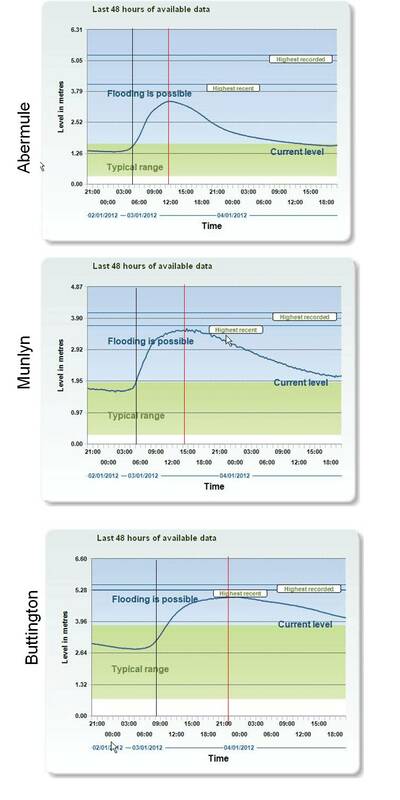 A routine overbank flood (c. 2-3yr RP) occurred on Wednesday 4th January in the Upper Severn reaches. Whilst unremarkable in itself and some 500mm below the critical stage of local embankments, the EA newly streamed hydrographs show clearly the ‘natural’/current attenuation afforded, in particular, by the Munlyn-Buttington reach. It is notable that the rising ‘limbs’ of the Munlyn and Buttington hydrographs lagged Abermule by approximately 1 hour and 4 hours respectively (0430, 0515, and 0815). However the peaks at Munlyn and Buttington lagged Abermule by approximately 3 hours and 11 hours respectively (1115, 1415, and 2200). Furthermore the durations of the three hydrograph peaks (considered from ‘rising-inflection-point’ to ‘falling-inflection-point’) were 13 hours, 16 hours and 24 hours respectively. In general terms, the landscape between Munlyn and Buttington is relatively natural; it has evolved ad-hoc. Whilst there are infrastructure crossings and some legacy flood structures , it is as yet unengineered in respect of flood-risk. It is suggested that, if the duration at Buttington had also been 16-17 hours (ie if the floodplain had been dysfunctional, say canalized), then the peak-stage at Buttington would have been higher ? This needs little argument; it is not uncertain. By the same token – indeed the reverse of the same coin – if the floodplain were to be ‘soft-engineered’ (ie more functional and thereby the peak at Buttington of longer, say 30 hour duration) evidence indicates that Buttington would be then of lower stage. 1. Two significant tributaries join the Severn between Abermule and Munlyn, but no significant tributaries enter the equation on the Munlyn-Buttington (c. 10km) reach. 2.Cross-sections at Munlyn and Buttington are broadly similar.